Michael Raupp. Courtesy of Raupp Memorial Museum, Buffalo Grove, Illinois. [S11] John J. Weidner, Compiled Birth, Death, 350, 408, 411, 431, 438, 444. 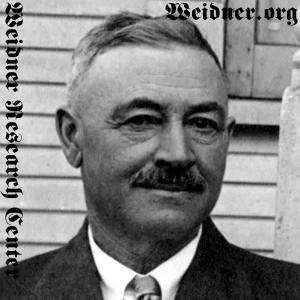 [S11] John J. Weidner, Compiled Birth, Death, 438 date only. [S148] Arlington Heights Herald, 20 Jan 1955, sect. 1, p. 5, col. 3, date and city. [S11] John J. Weidner, Compiled Birth, Death, 431, 438. [S93] Arlington Heights Herald, 24 Dec 1943, sect. 1, p. 2, col. 3, Marriage date only. [S1060] Theresa Raupp, State of Illinois; Department of Public Health - Division of Vital Statistics; Certificate of Death, No marriage date or location. [S11] John J. Weidner, Compiled Birth, Death, 431 & 438 date only. [S148] Arlington Heights Herald, 20 Jan 1955, sect. 1, p. 5, col. 3, date and location. [S11] John J. Weidner, Compiled Birth, Death, 431. [S11] John J. Weidner, Compiled Birth, Death, 411.